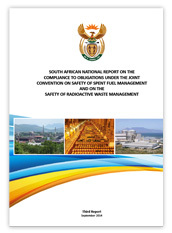 The NNR is mandated in terms of section 5(e) of the NNR Act, to fulfil South Africa’s obligations in respect of international instruments concerning nuclear safety; and to act as the national competent authority in connection with the International Atomic Energy Agency’s Regulations for the Safe Transport of Radioactive Material. Additionally, to support the achievement of continual improvement, the NNR ensures that its regulatory practices are in line or benchmarked against best standards and practices as applied internationally within the nuclear industry and more particularly within the associated nuclear regulatory authorities fraternity. For this reason, the NNR participates in relevant international meetings, bilateral cooperation initiatives and regulatory fora. In terms of section 5 (e) of the NNR Act one of the objectives of the Regulator is to “fulfil national obligations in respect of international legal instruments concerning nuclear safety”. 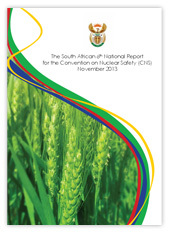 The NNR is the competent national organisation with respect to implementing the above two Conventions. South Africa ratified the Convention on Nuclear Safety (CNS) in 1996 and South Africa’s obligations under the CNS entered into force on 24 March 1997. The obligations of the Contracting Parties are based on the principles contained in the IAEA Safety Fundamentals document “The Safety of Nuclear Installations”. These obligations cover aspects such as, siting, design, construction, operation, the availability of adequate financial and human resources, the assessment and verification of safety, quality assurance and emergency preparedness. The CNS is an incentive instrument and is based on the common interest of Parties to achieve higher levels of safety which will be developed and promoted through regular meetings of the Parties. The CNS obliges Parties to submit country reports on the implementation of their obligations for “peer review” at meetings of the Parties to be held at the IAEA. The joint convention on the Safety of Spent Fuel Management and on the Safety of Radioactive Waste Management. South Africa acceded to the Joint Convention in November 2006 and South Africa’s obligations under the Joint Convention entered into force in February 2007. The Joint Convention applies to spent fuel and radioactive waste resulting from civilian nuclear reactors and applications, and military or defence programmes if and when such materials are transferred permanently to and managed exclusively within civilian programmes, or when declared as spent fuel or radioactive waste for the purpose of the Joint Convention by the Contracting Party. In addition, the Joint Convention applies to planned and controlled releases of liquid or gaseous radioactive materials from regulated nuclear facilities into the environment. The obligations of the Contracting Parties with respect to the safety of spent fuel and radioactive waste management are based, to a large extent, on the principles contained in the IAEA Safety Fundamentals document “The Principles of Radioactive Waste Management”, published in 1995. They include, in particular, the obligation to establish and maintain a legislative and regulatory framework to govern the safety of spent fuel and radioactive waste management and the obligation to ensure that individuals, society and the environment are adequately protected against radiological and other hazards, inter alia, by appropriate siting, design and construction of facilities and by making provisions for ensuring the safety of facilities both during their operation and after their closure. Also, Contracting Parties have the obligation to take appropriate steps to ensure that disused sealed sources are managed safely. The IAEA safety standards establish fundamental safety principles, requirements and measures to control the radiation exposure of people and the release of radioactive material to the environment, to restrict the likelihood of events that might lead to a loss of control over a nuclear reactor core or a radioactive source and to mitigate the consequences of such events if they were to occur. The NNR participates in the Multinational Design Evaluation Programme (MDEP) – a multinational initiative, started in 2006, to develop innovative approaches to leverage the resources and knowledge of the national regulatory authorities that will be conducting a review of new reactor power plant designs. The MDEP is organised under the auspices of the OECD Nuclear Energy Agency, which performs the technical secretariat function for the programme. The Regulatory Authorities of Canada, China, Finland, France, Japan, the Republic of Korea, the Russian Federation, South Africa, the United Kingdom and the United States participate in this multinational programme. In accordance with the MDEP, nuclear regulators are aiming to enhance safety world-wide, via increased cooperation. Enhanced cooperation amongst regulators will improve the efficiency and the effectiveness of the design review process, which is aimed at an increased convergence of regulatory practices. However, the participating countries will retain their sovereign authority over all licensing and regulatory decisions at all times. The programme is directed by a Policy Group, comprising the heads of regulatory authorities of the participating countries. A Steering Technical Committee (STC), comprising senior level representatives from the ten participating regulatory authorities, was established to implement these activities. The NNR’s participation in this forum is important in terms of South Africa’s envisaged nuclear expansion programme which will require the NNR to licence all stages of the nuclear power plants. The NNR is a member of NERS (Network of Regulators of Countries with Small Nuclear Programmes) and as such, shares experiences, associated with regulators of countries having a small nuclear programme. The NNR is part of a group of regulators from countries in which nuclear power stations from Areva (formerly Framatome) designs are operating. This forum is named FRAREG and comprises regulatory authorities of Belgium, China, France, South Korea and South Africa. This forum meets on an annual basis with the objective to share experiences related to these nuclear power stations of similar designs operating in the “FRAREG” countries. The NNR maintains a network of memoranda of understanding with nuclear regulatory counterparts from around the world with the objective of strengthening nuclear safety standards with respect to nuclear facilities and activities through technical cooperation and information exchanges in nuclear regulatory matters. The Forum of Nuclear Regulatory Bodies of Africa (FNRBA) is represented by 28 member countries in Africa. South Africa plays a leading role in the FNRBA which was given impetus by the coming into force through the Pelindaba Treaty. Regionally, the NNR participates on the technical steering committees and working groups of the FNRBA. The NNR coordinates Technical Working Group(TWG) 3 which focuses on Regulatory Infrastructure for Nuclear Power Plants and is represented by 17 countries – (Burkina Faso, Democratic Rep. of the Congo, Egypt, Ethiopia, Ghana, Kenya, Libya, Morocco, Namibia, Niger, Nigeria, Senegal, Sudan, Uganda, Tanzania, Tunisia and South Africa).